There are a few misconceptions connected with baby sunblock that I would like to share. One of the first things to understand about sunscreen is that officially there are no sunscreens out there that block the sun's rays completely. So anything branded as a baby sunblock must never be seen as something that will block out all the sun's rays once applied. This has been an assumption made by many consumers in the past and thus the Food and Drug Administration (FDA) has actually now legislated that no sunscreen manufacturer can brand their sunscreen as a "sunblock"
Another important note is that many brands of sunscreen have a baby sunblock as part of their product range that is actually no different at all to the normal products in terms of ingredients and so should not be treated any differently. So, although it's fine to use a "baby sunblock", don't necessarily go out of your way to buy one, unless you inspect the ingredients and know they are worthwhile. Many people buy the highest possible SPF thinking this will provide the best possible protection for themselves and especially for their baby. Using a sunscreen with an SPF of anything over 40 does not provide you with much more protection - as a percentage increase in protection it is minimal. 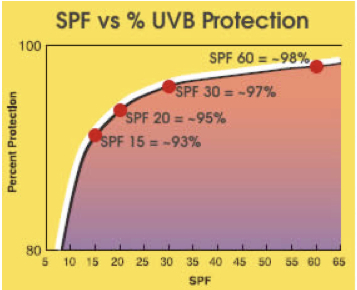 If you look at this chart, you will see how as the SPF curve flattens, so you only acquire a very small percentage increase in protection as the SPF increases. Note: there is no such thing as 100% protection. Beyond these misconceptions, the best recommendation when choosing a sunblock for your baby, is to choose a "physical" or "chemical-free" sunscreen made with zinc oxide. This is not only because it is a non-toxic option from all the sunscreen active ingredient possibilities, but because it provides excellent broad spectrum protection. ie. 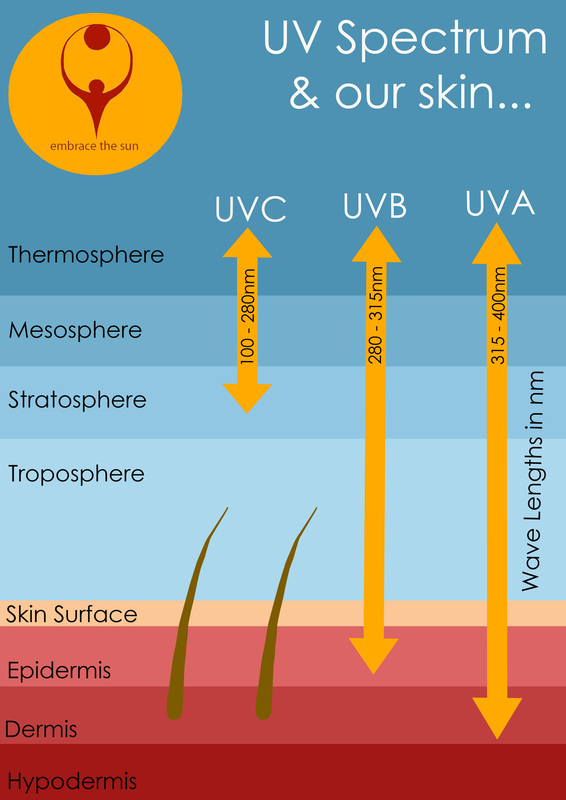 from both the UVA rays and the UVB rays and not only the UVB rays. High SPF protection and no UVA protection is effectively the worst choice of all. You child's skin may not burn but there will be a far deeper level damage to the skin from the UVA rays. As the UVA rays penetrate deeper into the skin layers, they potentially cause the DNA damage that not only leads to skin cancer, but the dreaded melanoma. UVB rays are the ones that cause the skin to burn, as well as damage to the DNA. With only protection from the UVB rays, the skin will not turn red and therefore not caution you to get out of the sun. This means you stay out longer in the sun than you would normally without any sunscreen. It may provide you with a confidence that the baby sunblock has worked when there is no sign of sunburn. But in reality it has allowed the UVA rays a longer time to do their damage. Most importantly, it is advisable to keep a baby younger than 6 months out of the sun altogether, whenever possible. Their skin is too fragile for the harsh effects of the sun. However, if it is just not possible to keep them out of the sunshine, make sure you protect your young baby's exposed skin with a quality sunscreen, plus good quality sun protective clothing and shading. 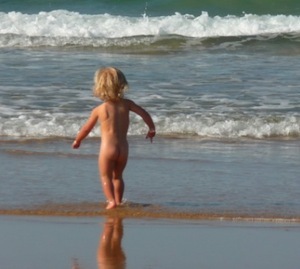 A zinc oxide baby sunblock will sit on top of the skin, forming a barrier against the sun's rays, which is far preferable to the chemical sunscreens, which are absorbed into the skin. This also allows you to lather the sunscreen on generously, whereas if it were a chemical sunscreen, I would be extremely hesitant to lather it on that generously knowing that the chemicals will be absorbed into the skin. Sunscreens with a zinc oxide physical barrier start protecting your baby as soon as you put them on. Chemical sunscreens, however, require 15 to 30 minutes in advance of being exposed to the sun, to give the skin time to absorb them first. This also means that when you re-apply a zinc oxide sunblock when at the beach or such, it will be effective immediately.